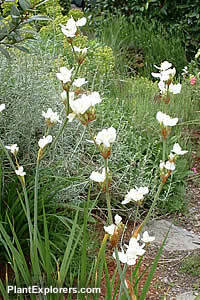 This evergreen perennial has strap-like green leaves and bears saucer-shaped white flowers in spring and summer. This easy-care plant is drought-tolerant once established. Height and spread to 3 feet. For maximum freshness, please keep seed refrigerated in its original packaging until it is time to plant. Sow seed in containers as soon as ripe. Grow in moderately-fertile well-drained soil in full sun.